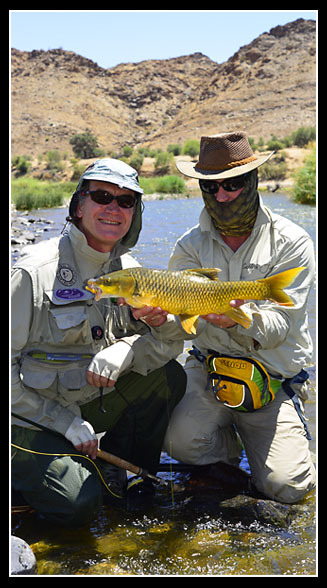 Catfish Joe's Fly fishing South Africa wilderness raft or float offers amazing Fly Fishing for yellowfish holidays / Adventures in South Africa to exclusive remote and breathtaking fishing hot spots on the Orange river in the Northern Cape, Western Cape, Mpumalanga and Limpopo and other provinces. 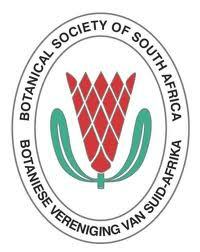 Join us for a trip of a lifetime and experience South African fly fishing at its best..and as a conservation based corporation we prefer to expose anglers to our magnificent indigenous species. Our Exclusive yellowfish wilderness drift by raft fly fishing package is arguably the most unique and exclusive on the Continent and at the least compare with the very best in the world. 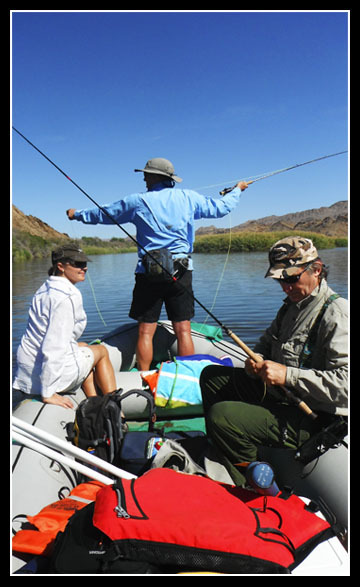 A Fly fisherman/woman can without a doubt experience arguably one of the top 3 Angling travel friendly destinations in the world. Our fishing waters are all within close proximity of all the Major Game reserves such as the Kruger National Park, Kgalagadi Trans frontier park, Pilansberg etc. as well as Sun City and our fishing holidays can all be linked to some of the most wonderful natural history experiences on the planet. Whether its Largemouth or Smallmouth Yellowfish,or some of the other yellowfish species , Catfish of up to 100 pounds, tilapia, the mighty powerful Mudfish, Clanwilliam Yellowfish, Whitefish or Sawfin you will almost certainly want to book your follow up trip before you leave South Africa. We are not just specialist anglers, We have been in the 5 star International Tourism industry for more than 20 years and understand what is required from a standards and hospitality point of view. Futhermore we have been producing Fishing films for over 10 years for a wide range of platforms including Broadcast TV and have the largest High Quality web based fishing channel in the country. Catfish Joe Productions also specialises in Web design and multi media. “Catfish Joe Productions” was the first sponsor of the first yellowfish telemetry research in South Africa and is dedicated to the yellowfish conservation. We have exciting photo competitions where you stand a chance to win great prizes and fishing trips. Visit our "Catfish Joe Fishing" Fan Page on Facebook to see updates and fishing trip memories or check out our Catfishjoeproduction Channel on You Tube. Now also for the first time! 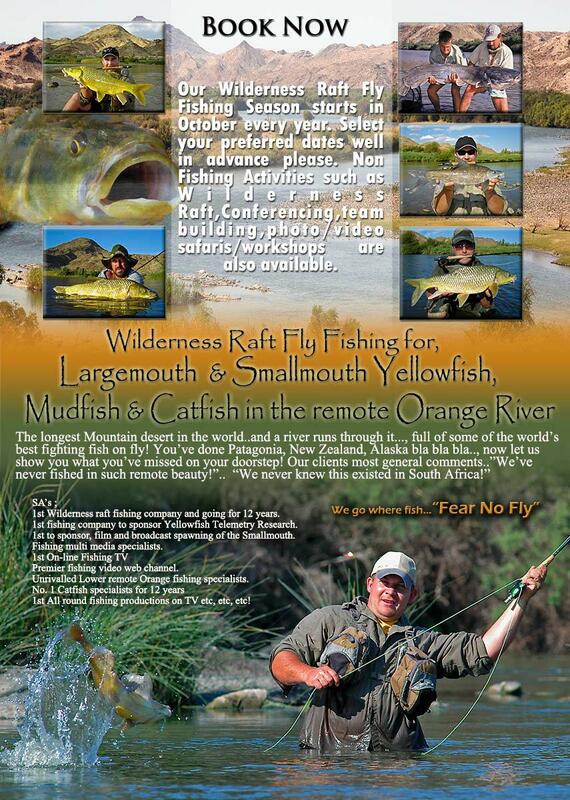 Combined "rafting for the family and the serious fly fishermen". Some good guiding evidence. Cell phone video clips of one of many of Derrick's smallmouth yellowfish. Visit our video page or YouTube channel for more.